The Partagas Salomones is a full bodied Piramides, a beautiful Habano, 7.2” (184mm) long, of 57 ring gauge, and comes in a box of 10 cigars. 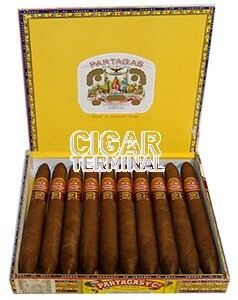 The famous Partagas Salomones have made their return. A nice smoke, though not for the beginner. A classic Partagas brought back to life. One of the best figurados ever made. This is not an official Habanos production. These were first made upon a request of a client and the success was so high that they were produced again and again at Partagas factory available only for travelers who visited Cuba. One very good cigar to try if you haven't already. Have 1 box left from the 5 I picked up in 2010 (I think) and they are now even mellower and creamier than when they came out. Some had rolling issues but if you come across a box you should try them. Lovely smoke and a great treat to have in your humidor, not to be had every week but you'll remember where you were and what you were doing when you have one. Usual great service and very fresh product from CT, even got some plume on one or two. Every thing about this Cuban cigar is wonderful, the taste is spot on and grows to the final third because of the shape. Just awesome. Try 10 if you have not before, you will not be disappointed. The only reason that they are not a 5-star is price. CT runs from $20 USD to $50 USD on a 10 count higher than other high rated sites. Still can't beat the service and freshness of CT, maybe it's worth it?